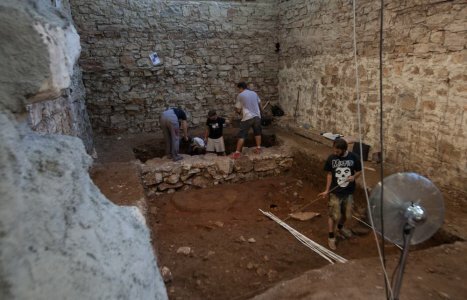 Research that began last year in the building of the Archaeological Museum, which is currently being renovated, already shows that this institution conceals treasures, not only within its walls, but also below the surface. Altogether 232 sq meters, 4 meters in height have been researched. In addition to many finds from Antiquity, a layer with regularly arranged amphorae that served for draining away water and fragments of stone monuments have been found. At the moment, prehistoric layers dating from the Histrian period are being researched. Apart from the dry-wall structures and hard-packed clay flooring, remains of furnaces and fireplaces have been found, as well as numerous fragments of prehistoric ceramics, several bronze rings, fibula fragments, fragments of ceramics dating from the 4th – 2nd century BC, and a great number of animal bones and shells. In addition, two intact vessels have been discovered, one of which is an amphora dating from the 4th – 2nd century BC. Research is now underway and will surely reveal priceless treasures.